My favorite night of television is here! While I enjoy seeing people getting praised for work well done on their films the main reason I love watching is the red carpet! I loooove the red carpet. All of the beautiful dresses, well most of them are beautiful dresses, the gorgeous jewelry, the excitement...it is what Hollywood should be and rarely is nowadays- glamorous! Back to the man of the night. 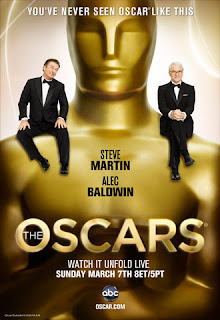 Do you have any preferences on who takes home Oscar tonight? I enjoy seeing some of the "interviews" on the red carpet... Some of the outfits are really way out there and wild - but some of the dresses make the person wearing them just eye-popping. :) I don't think I saw any movies this year - so no votes for Oscar from me. Don't feel bad, I didn't see many of the movies nominated. I was so happy to see Sandra Bullock win. She seems like such a down to earth type of person so I am always rooting for her. The "interviews" crack me up when you see the same people saying the same thing on every channel. To tell you the truth there was nothing that really stood out for me last night as far as the outfits. There were none of the dresses that particularly disgusted me, but also none that I will remember by next year.